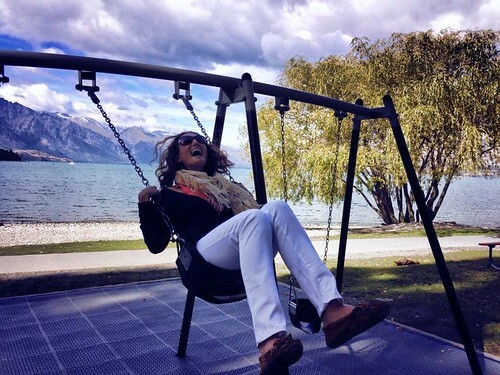 Three mostly sunny months later, and we've concluded our time in Queenstown. Though I wish the place was about 10 degrees warmer at all times, living in the "adventure capital" of the world did have its perks. When Arno from Expedition X invited us for a packrafting trip, we said, "Absolutely!" 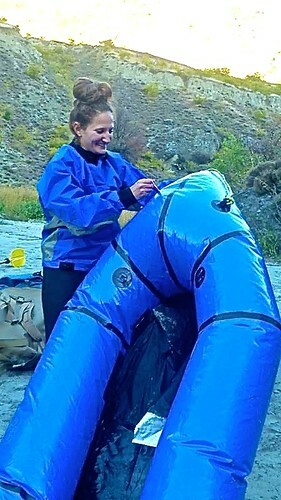 Having little to no idea what packrafting was, we were pleased to discover how much fun it is. Intrigued? 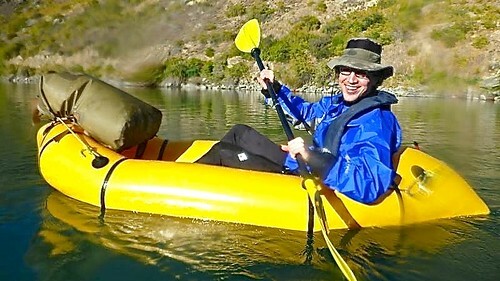 Basically, a packraft is an inflatable one-man vessel that you can take on rapids and rivers. It rows sort of like a kayak but it's wider like a raft. The coolest thing is that it packs away into a tiny ball weighing 2kg and you can put it into your pack, which means you can hike into some forest and raft out all on your own. 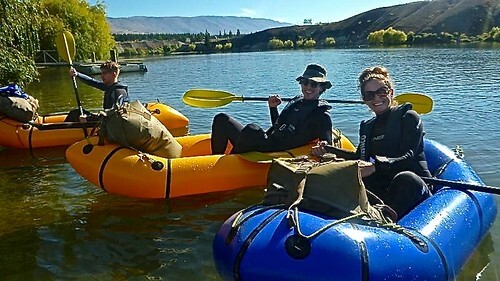 I wish I could say that we did a crazy adventure, but we only had time for a half day trip on the Kawarau River. It was still beautiful though and we learned a ton about how to navigate and control the boat while exploring the little inlets and beaches. Makes me want to own one of these babies! 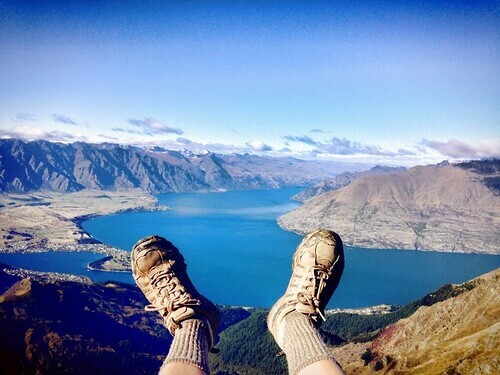 One of the best things about living in Queenstown is that you can access a bunch of great walks right from town! 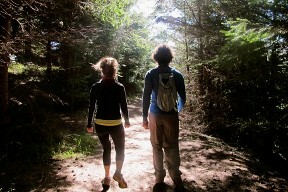 This makes it super convenient for those of us who don't have cars to access nature. You have several options for getting up to the Summit, including paying to take the Gondola, which cuts about 1 hour of walking. You can also take the Tiki Trail (not recommended as it's better to take down) or the Skyline Gondola Access Road. 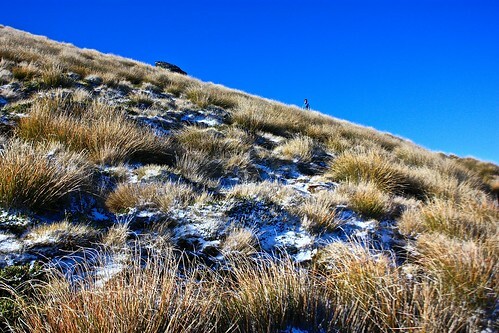 The latter is a wide open road and the fastest way to access the trail to Ben Lomond. 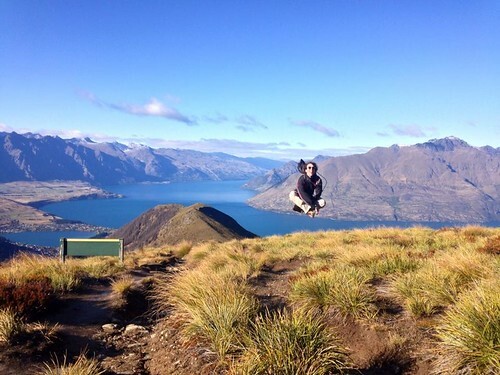 At the Ben Lomond Saddle, take some jumping shots if you're so inclined! 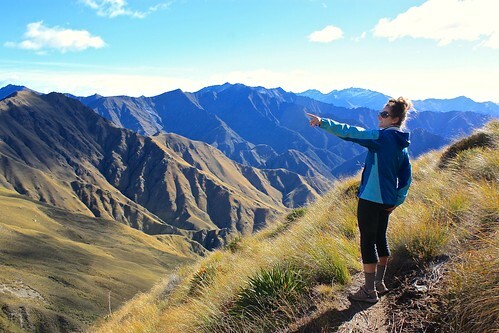 There are several other amazing walks that leave from Queenstown, including Queenstown Hill, the Frankton Track, and the walk out to Sunshine Bay. Even walking around Queenstown Gardens is awesome. Having all these walks at our disposal made not having a car a lot easier--warmer temperatures would have been the icing on the cake! 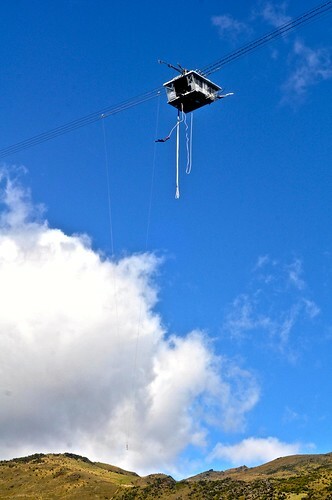 Our bungy trip began with a 40-minute ride to the Nevis site, which is close to the "desert" of New Zealand. While the first 30 minutes of the trip were on the main road, the last 10 or so were when things became real. As our truck/bus climbed up a narrow winding dirt road, I looked out the window, all the while seeing the Nevis River, the one we were going to bungy over, getting farther and farther away below us. 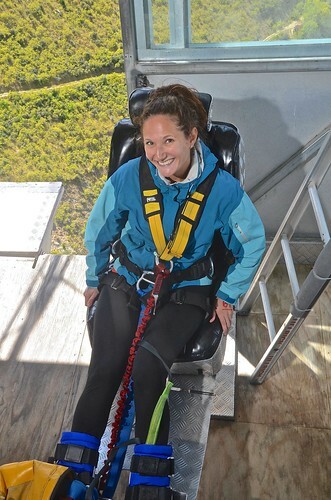 As soon as we arrived, we got harnessed in, reweighed, and directed onto the cable car that took us out to the Nevis Bungy platform, 134m (~450 feet) above the Nevis River. What I found most surprising was how smooth the actual jump was. There was no sharp pull on the bungy cord once it caught, only a feeling of sailing through the air with little concept of up or down. The feeling of zero gravity is amazing and like nothing we've ever experienced before. Rob kept saying he felt as if he was flying through a vortex, one that ended in the bright blue of the Nevis River below. One of my favorite New Zealand experiences for sure! 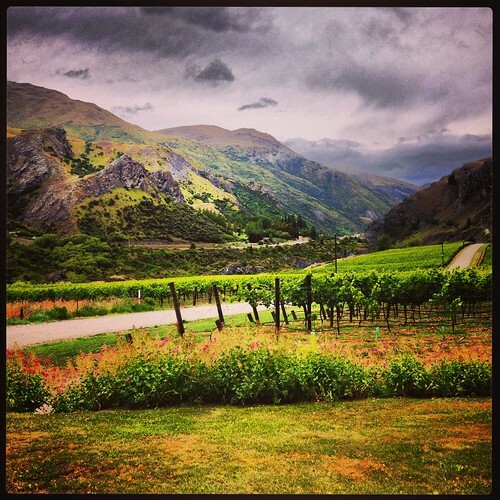 The Gibbston Valley is about a 20 minute drive out of town, and there are tons of wineries to explore. 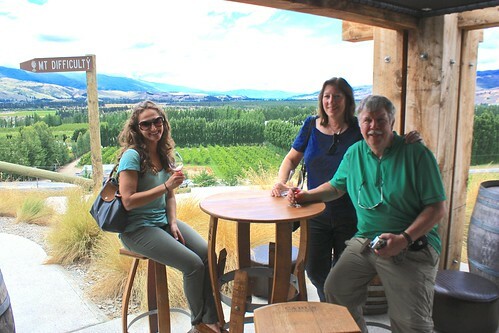 My favorite is Chard Farm, which is a small winery with awesome views near the Kawarua Bridge bungy site. 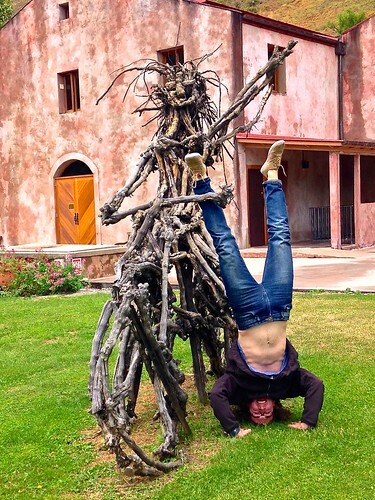 Chard Farm has an idyllic setting, a Burning Man-esque statue, and some nice pinots. This is Rob trying to win us a free weekend at the Chard Farm cottage for my 30th birthday. The owner told him he got an A for effort. 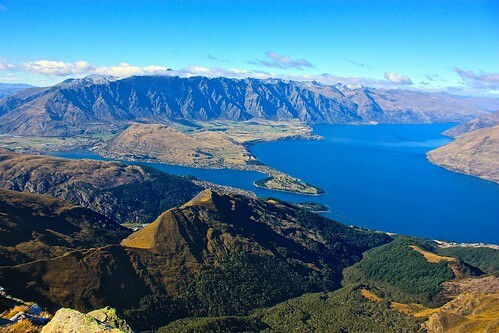 Central Otago is 45 minutes from Queenstown and is New Zealand's most famous region for pinot noir, which just so happens to be my favorite wine (along with the most expensive varietal). Lucky for us, most wine tasting in New Zealand is dirt cheap, as in either free or a "gold coin" ($1 or $2) donation. 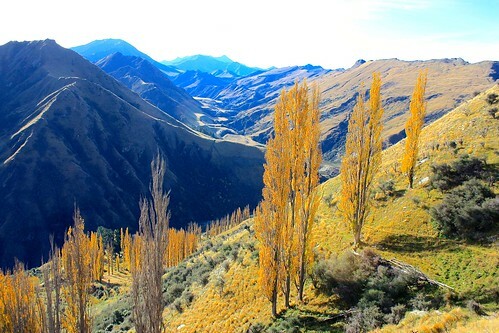 My favorite area in Central Otago is the Bannockburn region, which is known as the desert of New Zealand. It was pretty incredible to see the change in landscape from Queenstown. The views at Mt. Difficulty were sublime, and the wine wasn't half bad either. Even though you can't sit on the terrace unless you buy a flight, you're welcome to go out there with your glass and take in the views. What were your favorite things to do? Let us know in the comments!